Saturday May 10 – heading back to Poland for a show in Poznan, Poland. This will be our longest drive on the tour so far. We are cutting across from southeast Czech Republic to the more central Polish city of Poznan. Poznan is rather beautiful, with a mix of older structures and modern ones. It was not destroyed by the war and the central square is vibrant, colorful, and lively. 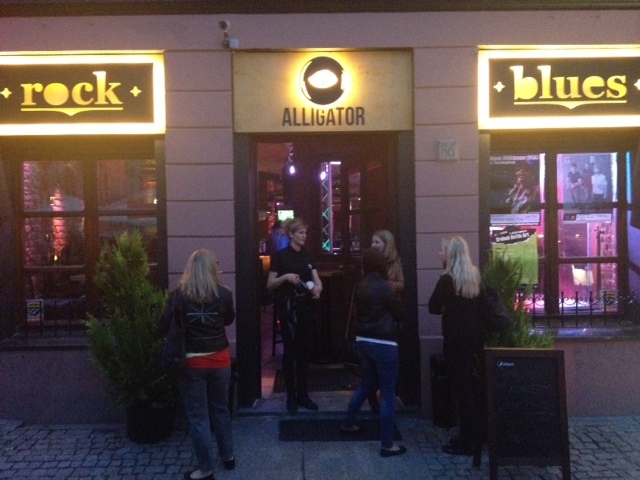 We are playing the Alligator club located right in the main city square. Due to a series of minor issues – the long drive, a big detour, city traffic, a late-arrival of the sound man, etc – we get less time to explore Poznan than initially expected but we get a nice flavor of the city center. Saturday night in the city brings out all types. There’s the wealthy locals sitting in the outdoor restaurant and cafe seating areas smoking, there’s tourists snapping photos, a lot of young people out drinking and courting, and one corner of the square with a neglected building hosting squatters (who are putting on a punk rock show inside this prime real estate tonight) despite the city’s protests & attempts to remove them. Inside our venue, we are ready to play two sets. It’s a full house with a very likable local blues man, Dr. Blues, in the audience that is peppered with seemingly one or more of every type of person we saw on the square: young and old, locals and tourists, Polish hipsters and the occasional drunk. The first one starts awkwardly for me when the bass drum pedal moves on me in the middle of the 2nd song, Devil Eyes. It’s a quick recovery, thank goodness, but I got a laugh out of it when I was fighting back the fog machine’s surprising emanations to my left. Here’s a side note: We do sound checks pretty much every night and I’ve gotten used to using these opportunities to look up and see (usually, guess) what kind of light show we are going to get with our night. It’s great when a venue gives you a sense of the whole experience that we will face on stage that night, including lights. But dammit, could you give a heads-up that you’re gonna pull out the fog machine?!?! Seriously, I don’t mind a bit and the staff at the Alligator are about as nice and accommodating as anyone could wish for … but that doesn’t mean we weren’t surprised when the fog kicked on! The look on Stefan’s face as he leaned back in my direction when the fog exploded was priceless. Stef had some tuning issues tonight dearly during the first set. We blamed it on the fog! But we even out very nicely and the latter half of the first set was strong. The second set felt really good, we were loose and having fun. The crowd was apparently loose too. During our final song, Cocaine Baby, some guy got up on stage and began talking into the mic. Joe was smooth and quick, kicking (and I mean literally kicking) this guy off stage without losing the beat or groove. Security escorted the guy out the door a moment later, but if you’d have had your back to us while ordering a drink at the bar during this song you’d have been none the wiser to what just happened. After the set we loaded out the gear and we were hungry. This gave us one final opportunity to see the Poznan square. It was getting weirder now. It’s late and bars are letting out. Police sirens and drunken young men are falling and rough-housing in spots near and around the square. It was interesting to watch, but similar to an experience I had a few years ago in Derry, Ireland where there was way too much testosterone, alcohol, and fisticuffs flying around to feel good being an outsider amidst the mayhem of the nearly full-mooned night. Best to get the hell out of there and wind-down for the night. 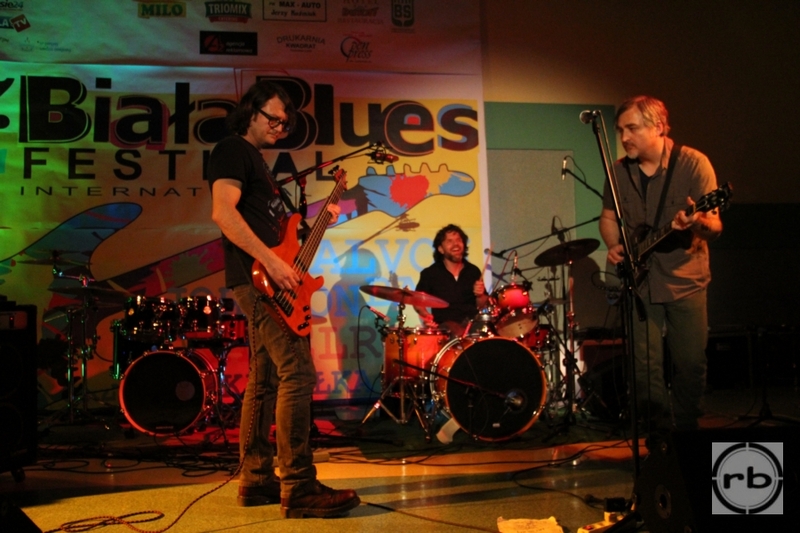 Sunday May 11 – Biala Podlaska, Biala International Blues Festival. Another relatively long-drive for European touring today, approximately 5-6 hours. We are going as far east as we will go in Poland, getting about 40 km (25 miles) from the Russian border. We joke a bit about “wandering” into Russia, but we know it’s no joke, not with the hostile situation raised by Russia towards the other neighbor in the region, Ukraine. Ewa, our tour manager, assures us it is unlike any other border we would wander upon in our travels. We would not just pass through without an inspection and that’s something we’d not be interested in. It would make last night’s Poznan late-night drunk boys look harmless in comparison. We are playing the 7th Annual Biala International Blues Festival. It is a relatively small festival, compared to what many Americans will think of in terms of a festival, but it is still an important international event for this medium-sized town. There’s a lot of local media covering the event, including a big article in the local paper & the local television station is covering the event. We are playing in the early evening between a very talented local trio and the Alvon Johnson band. Johnson is from San Francisco and plays with a band of Polish musicians that back him and other blues & rock acts from around the globe. There was a great deal of skill on display tonight, as Alvon was a great showman and guitarist with what we all agreed were the best vocals we’ve heard all tour. Because of our long drive and early set time we only got a line-check, but with the exception of minor on-the-go adjustments in the first two songs, we quickly hit a groove. Stefan’s throat was giving him difficulty before the gig but he powered through with only one song, Lord Have Mercy, being a strain on him [This has been one of several songs I have truly enjoyed pushing myself vocally on, and despite the tickle in my throat, I really felt that I pushed through this song during this set – it felt powerful and spot-on. The band kids me when I tell them I feel run down before any given set, as it usually ends up being an especially strong performance. Challenge is good for the soul. -SZ]. The energy was great and we were really have a great give and take with the audience. This had to be one of our best, if not our best show on the tour. The sound was really good and there were hollers and lots of applause. They dug our energy and enthusiasm. After our set, we didn’t have to make a full strike of equipment because of the way the stage was prepared for Alvon’s set. I was asked for a quick interview with the tv station and then we went out to meet the people in attendance. It’s so much fun having these moments after shows. I know I used to avoid them a few years ago, but touring with T Model Ford changed a lot of my perspectives and experience around this. In Europe, and especially in the parts we’ve been touring on this trip, they want to have you sign the CDs and LPs they are purchasing. There’s lots of photos taken. What’s more, the language element makes things more challenging and, in a way more exciting and mysterious. There was a gentleman a generation older than me that approached me right after I entered the large hallway outside the performance auditorium after the tv interview. He introduced himself as Richard & he spoke English very well. He was rather distinguished in appearance with a very modern and stylish casual suit, minus the tie. He appeared worldly and refined while beaming an inviting smile. We immediately connected. He was gracious in his compliments and insights. He remarked about the music and the delivery of the performance. I watched others around us attentively peering and listening into our conversation. Within moments, as I tried to balance signing merchandise and posing for pictures with continuing this conversation with Richard, it quickly became evident that a group of concert-goers were really into this. Richard graciously served to interpret questions and answers between me and local Polish people. I loved this/these sets of interactions. People really got into the music. As Stefan and the festival promoter separately pointed out later, there was an incredibly positive response from the youngest of the concert goers. I had a one young man (probably 13-14) really working on his English with me: “I like metal most and I came with my family,” as if to indicate that this would not have been his first choice of concerts but then he added “I loved it! It is really in me,” and he pointed to his heart and beamed a pure & innocent smile. There were some people who seemed reluctant to approach us but snapped pictures. We encouraged them to come in closer. It’s amazing how just exchanging names and sharing in music can bridge a social and cultural divide. This alone is worth it to me. I can give a quantifiable measure that we sold the most merchandise (CDs, LPs, T-shirts, etc) at this show, but the greatest measure was from the response from the crowd.